If you're looking for maximum safety in an SUV, choose one of the top picks from SUV crash test ratings. Luxury vehicles are some of the best engineered vehicles on the market. These cars feature some of the most modern and even futuristic safety measures. All of the cars listed below were given a Top Safety Pick for 2010 from the Insurance Institute for Highway Safety. In order to get on the list, the car must have passed all three crash tests and received their highest grade of "Good." They also need to have electronic stability control. Electronic stability control is one of the most important developments in the past 20 years. ESC aids against skidding and rollovers. It senses a skid and will brake automatically to help correct your steering. The IIHS deemed that the feature can prevent one third of all fatal accidents. Crash test results for the Acura TL showed that the dummy was well controlled and that injury risk was minimal. The car features a lot of what the other luxury sedans have, such as electronic stability control, daytime running lights, anti-lock brakes and a bevy of airbags. During crash tests, the risk for significant injury was low in an Audi A4. Side curtain airbags deployed during the test. Head accelerations were all deemed low. The car features front and rear head curtain airbags, as well as seat mounted torso airbags. There are also rear seat mounted airbags as an optional addition. It has electronic stability control, anti-lock brakes, and optional programmable daytime running lights. The A4 is priced at $45,000, and has an EPA estimated mileage of 28 miles on the highway and 20 miles in the city. It gets crash test ratings of "good" for frontal impact and "good" for side impact, according to test results of the IIHS and NHTSA. The car has a bevy of features, including electronic stability control. The Audi Q7 also features rollover sensors which deploy the airbags if the SUV senses a rollover. There are airbags located all throughout the vehicle (including the rear). It has anti-lock brakes, and also lane departure warning systems. This system sounds an alert if your car is veering into the next lane. During crash tests, the survival space of the driver was maintained and head acceleration was negligible, showing a low head injury risk. The results of the crash tests showed that the driver's survival space was well maintained in the BMW 3 series. Leg, foot and head injuries were deemed low. The driver's head did hit the airbag when it deployed. The car features front and rear head curtain airbags, and seat mounted torso airbags. The 3 series also features electronic stability control, anti-lock brakes and programmable daytime running lights. The BMW X5 is a staple in the luxury SUV market. Crash tests resulted in a low injury risk all around. The car features anti-lock brakes, and programmable daytime running lights. It also has electronic stability controls and rollover sensors. These two features work hand in hand with each other. There are also front and second row airbags. The Cadillac Escalade EX is a highly rated and safe vehicle with a MSRP of $68,775. The Cadillac Escalade EX is one of the best luxury trucks in crash test ratings and comes equipped with the same safety features found in all luxury trucks available. It gets crash test ratings of "good" for frontal impact and "good" for side impact, according to test results of the IIHS and NHTSA. The Cadillac SRX crash tests showed low injury risks all around, except for the right leg of the driver. The car features electronic stability control, rollover sensors, anti-lock brakes, daytime running lights and front and rear head, and seat mounted torso airbags. The Chrysler Town and Country offers a large amount of storage for the minivan category. It features the Stow and Go option for the seating in the rear and driver and passenger side airbags. The Ford F-150 Lariat has an MSRP of $39,000, and is a reliable and luxury truck highly rated for its crash test results. It has an EPA estimated mileage of 20 miles on the highway and 14 miles in the city. It featuring the same safety systems such as air bags, seatbelts and other equipment found in the GMC Sierra Denali, the Lariat was given a crash test rating of "good" for frontal impact and "good" for side impact, according to its IIHS and NHTSA test results. The GMC Sierra Denali is a well made, safe vehicle with an MSRP of $40,870. It has an EPA estimated mileage of 19 miles on the highway and 13 miles in the city. It comes equipped with the standard safety equipment you would expect for a luxury truck and has a crash test rating of "good" for frontal impact and "good" for side impact, according to test results of the IIHS and NHTSA. It is also available as a hybrid. The Honda Odyssey is by far the most expensive minivan on the market but offers the most reliable and safe mode of transportation in the minivan category. The Honda Odyssey holds up to eight passengers, the third row offers a 60/40 split bench seat and can be folded flat to the floor for extra storage if needed. The Honda Odyssey offers standard driver and passenger airbags. While the Kia Sedona doesn't offer the same qualities as the Honda Odyssey or the Toyota Sienna as far as handling capabilities, it gets the best ratings from the Insurance Institute for Safety for minivans. It comes with standard driver and passenger side airbags. The Lexus 600h L is a well made, safe hybrid vehicle with an MSRP of $106,000. It has an EPA estimated mileage rating of 22 miles on the highway and 20 miles in the city, and comes equipped with standard safety equipment like driver and passenger front air bags, front and rear side impact air bags. The car has a crash test rating of "good" for frontal impact and "good" for side impact, according to test results of the IIHS and NHTSA. The Lexus ES350 comes priced at $34,800. It is a reliable and safe luxury model that is highly rated for its crash test results, as many Lexus models are. The ES350 has an EPA estimated mileage of 27 miles on the highway and 19 miles in the city. It features the same safety systems such as airbags and seatbelts as other luxury cars in this class. It was given a crash test rating of "good" for frontal impact and "good" for side impact, according to its IIHS and NHTSA test results. The Lexus HS 250h is has an MSRP of around $32,000. One of the best smaller luxury hybrid vehicles, it also does well in crash test ratings. The HS 250h has an EPA estimated mileage of 34 miles on the highway and 35 miles in the city. The vehicle comes equipped with the same safety features found in all Lexus luxury cars. The car has crash test ratings of "good" for frontal impact and "good" for side impact, according to test results of the IIHS and NHTSA, which are similar to both the Lexus 600h L and Lexus LS 460. The Lexus LS 460 has an MSRP of $63,825, and is a reliable and safe luxury vehicle that is highly rated for its crash test results. With an EPA estimated mileage of 24 miles on the highway and 16 miles in the city, it features the same safety systems found in the Lexus 600h L and is also available as a hybrid. The Lexus LS 460 was given a crash test rating of "good" for frontal impact and "good" for side impact, according to its IIHS and NHTSA test results. The Lexus RX features the same safety features as the Cadillac SRX. However, there is also the unique feature of knee airbags for both the driver and the front passenger. Injury risk is low in this SUV. The Mazda 5 is much smaller than other mini vans, both on the interior and exterior. The gas mileage is better than that of other minivans in its class. While the third row seating is less roomy than others in this category, the Mazda 5 does offer standard driver and passenger side airbags. Mercedes C Class crash tests showed that head accelerations were low and that injury risk was minimal. The car features front and rear head curtain airbags, and seat mounted torso airbags. It also has the unique extra of knee airbags on the driver's side. There is also electronic stability control, anti-lock brakes and programmable daytime running lights. The Mercedes R Class crash results showed that head acceleration was negligible, reducing the likelihood of a head injury. There is a low injury risk on all parts of the body. The car is unique in that it has head curtain airbags for every seat, and front and second row seat mounted torso airbags. This is optimal for passenger safety. It also has electronic stability control, rollover sensors, anti-lock brakes and programmable daytime running lights. The Toyota Avalon is a well made, safe vehicle with an MSRP of $30,000. The Avalon is one of the best luxury vehicles made today and does extremely well in crash test ratings. It comes equipped with the same standard safety equipment found in most highly rated crash tested vehicles, such as driver and passenger front air bags and front and rear side impact air bags. The Toyota Sienna comes in close behind the Honda Odyssey. It offers room for eight people and standard driver and passenger side airbags. The Sienna has the most cargo room in its class and is available in all wheel drive. What Does Electronic Stability Control Mean? Electronic stability control is a safety feature on vehicles that can detect and help prevent skids. ESC also helps drivers recover from a skid that is already happening. ESC can help a driver keep control of the vehicle when driving on slippery roads. Electronic stability control makes use of sensors in the vehicle. These sensors are in the the wheels and steering wheel. They determine the direction that the driver wants the vehicle to go and compare that to the direction the vehicle is actually headed. When it senses that a vehicle is entering a skid, the computer will apply the brakes on the correct wheels to bring the skid under control. What are the Trim Levels for the Chrysler Jeep Patriot? The Chrysler Jeep Patriot is available in three trim levels for the model year 2011. The bottom of the range is the sport model, which is available in 4x2 or 4x4 configurations. The Latitude is the next step up, and like the sport, is available as a 4x2 or 4x4. The Latitude X is the top of the range and only comes as a 4x4. A 2.0 engine is available as a 2.4 litre engine. The Patriot starts around $16,000, and a fully loaded Latitude X tops out at around $22,000. The Patriot is considered a small to medium SUV and has been rated fairly well by industry experts. Which Luxury SUV has the Most Airbags? A luxury SUV vehicle tends to be quite safe. They all have a large number of airbags installed in both the driver and passenger areas. The Acura MDX and Audi Q7 are a few of the vehicles that contain the most airbags. Equipped with front, side and curtain protection, the Q7 also has side impact airbags for the rear seats. Though, when looking at luxury SUVs, finding the one with the best safety rating is more important than the number of airbags. The Infinti, Cadillac and Mercedes rank at the top of safety lists. Range Rover, Lexus and the Toyota Land Cruiser also make it into the top 10. When shopping for a luxury SUV, be sure to compare safety reports before making a final decision. What is the Average Price Range for a New Luxury Hybrid Car? As a luxury hybrid car is a relatively new vehicle, it is more expensive. A new luxury hybrid car such as the Lexus HS 250h can be purchased for $34,200, which is an average price, but the efficient fuel consumption will save money in the long run. The first ever eight-passenger luxury hybrid car is the Cadillac Escalade Hybrid, and will cost over $70,000. But at least the whole family can travel in style in this spacious luxury hybrid car that travels 20 miles per gallon. The BMW X6 Hybrid, which gets 18 miles per gallon, is the most expensive luxury hybrid car at $90,000, and this is the top end of the luxury hybrid car market. 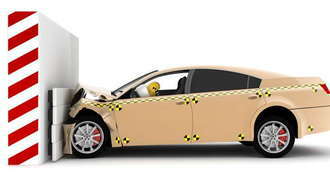 Do Vehicle Crash Test Ratings Affect Insurance Rates? Vehicle crash test ratings are not only important to determine the safety of the car, but they also determine the insurance rates. Along with other factors that affect insurance rates, such as driver's age and claim status, vehicle crash test ratings also play a role. The Institute for Highway Safety (IIHS) and the National Highway Traffic Safety Administration (NHTSA) determine the vehicle crash test ratings. There are benefits to having child safe cars and airbags, as this will cut insurance costs to consumers, as well as protecting them in the event of an accident. Insurance on a sports car will also be more expensive in many cases, as they are fast. What is the Hybrid Car Tax Rebate in California? A hybrid car tax rebate differs in every state and it is important to speak to your tax advisor about this subject as the laws differ slightly across the USA. In California, there are rebates of up to $5,000 per light-duty vehicle purchased after March, 2010. It is also possible to claim tax rebates for registration fees and other costs when you register your vehicle, but speak to the dealership where the car is purchased to get clarity about this subject. A hybrid car tax rebate is usually considered as it is an environmentally-friendly car that will consume less fuel and not harm the environment as much as a diesel-powered car. Which States Give a Hybrid Car Tax Beak on Year End Taxes? The hybrid car tax break began in 2006 in accordance with the Energy Policy Act. Unfortunately, since a lot of these funds have already been used and disbursed to the hybrid manufacturers, some do not qualify for a tax credit anymore. The Toyota Prius qualifies for a $3,100 tax credit and it is a better hybrid car tax break as than the Honda Civic credit which is only for $2,100. This hybrid car tax break is good news to a business owner who uses the vehicle for work, but always consult your tax advisor. Arizona, California, Colorado, Connecticut, Deleware, Florida, Georgia, Illinois, Louisiana, Maine, Maryland, Massachusetts, Michigan, Montana, Nevada, New Mexico, New Jersey, New York, Oklahoma, Oregon, Pennsylvania, South Carolina, Tennessee, Texas, Utah, Virginia, Washington and West Virginia all give year end tax rebates for Hybrid car buyers. Are Truck Safety Ratings Generally Higher than Sedans? For the most part, you will find truck safety ratings at the same rate or higher than the ratings of sedans for various reasons. One of those reasons is that a larger truck will have a more solid frame than a sedan because it is a larger vehicle, being able to protect the inhabitants of the vehicle when an accident occurs. The main problem with these larger trucks is that they are prone to rolling over on icy or wet roads, or if the driver takes a sharp turn at a high rate of speed because of their large size. Does the Government Require Safety Ratings on All Vehicles? The United States government does require government safety ratings on all vehicles that are going to be sold in the United States, including Alaska and Hawaii. These ratings are assigned by the National Highway Traffic Safety Administration to new vehicle models each year. This means that hundreds of safety tests are performed when a new vehicle is manufactured by a motor vehicle manufacturing company before it can be released to the public for sale on a dealer's lot. If the vehicle does not pass the safety tests from the NHTSA, then the vehicle will need to be updated and tested again until it passes. Are Luxury Minivans Generally Safer than Luxury SUV's? Luxury minivans such as the Chrysler Town and Country are very popular vehicles due to their comfort, cargo and passenger capacity and their fuel efficiency. Luxury SUVs are popular because of their size and luxurious appointments. However their fuel efficiency leaves something to be desired. Most luxury minivans are fully equipped with airbags and full shoulder harnesses for passenger restraint and protection. Luxury SUVs will also have shoulder belts and airbags, plus they have increased size and, usually, ride height to help with passenger protection. However, the increased ride height can be a problem in certain types of accidents. Minivans and SUVs are thus pretty much equals in passenger safety.